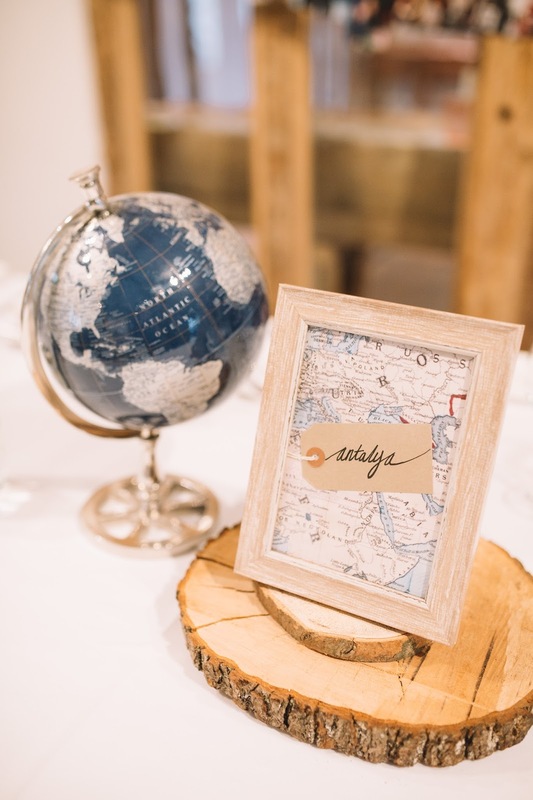 Getting your wedding stationary personally designed can be super costly, but if you’re a little crafty and you don’t mind getting into DIY bride mode, you can save yourself quite a bit of money. Some of you may know I am a Digital Designer by day, and I used to create hand-made collages back in the day. 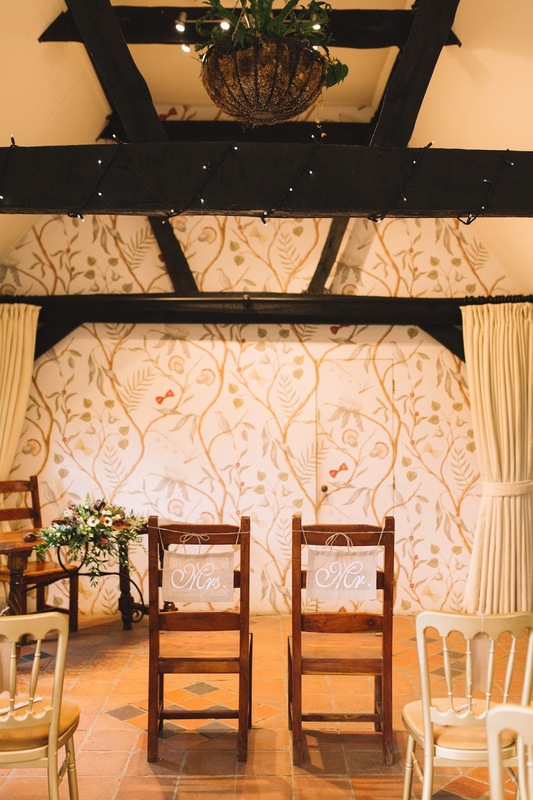 During my wedding planning, I had the chance to get my hands dirty and create some beautiful (if I say so myself) digital and hand-made designs. So, I thought I’d share these with you, alongside some tips and tricks. 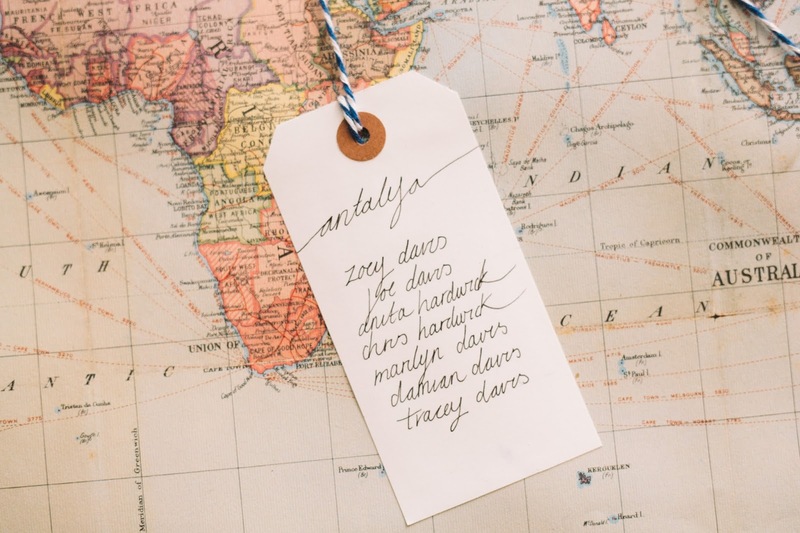 First things first, design the save the date invitations! These were the first things I designed, which I did 10 months before the wedding. At that moment, I had no idea what theme I wanted, I just knew that I wanted something that had blues, golds and looked quite classy. Looking back, these don’t really flow with the world/travel theme, but I’m happy with the way they look. When I printed them and wrapped them in twine, I was so proud, ha. 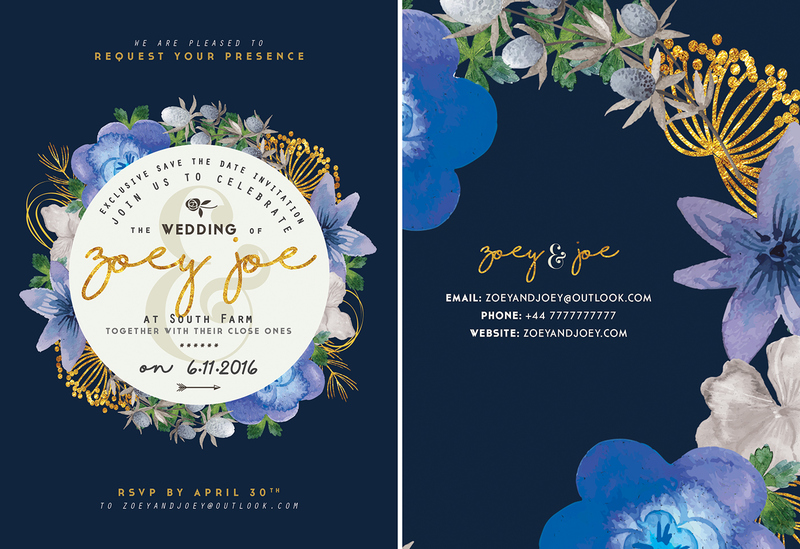 If you’re pretty graphic design savvy, you can design your invites in Photoshop or Indesign. Or maybe you have a graphic design friend who can mock something up for you. Doing these myself saved me a huge chunk of money as I only had to order some A5 cream card, some twine and a gold pen from Amazon! 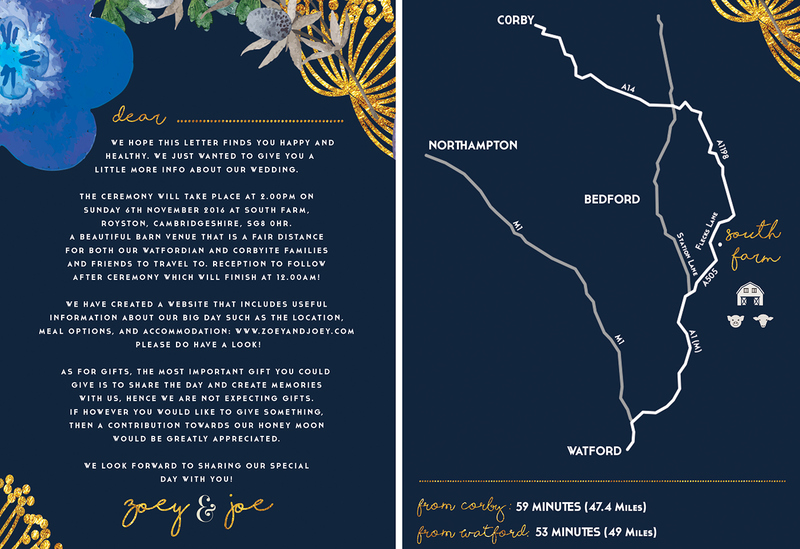 Printing them wasn’t too costly either – as long as you have a good printer and some ink!If you don’t fancy designing them yourself, there are also tons of people on etsy and notonthehighstreet that create personalised invitations, so I’d highly recommend going on there. 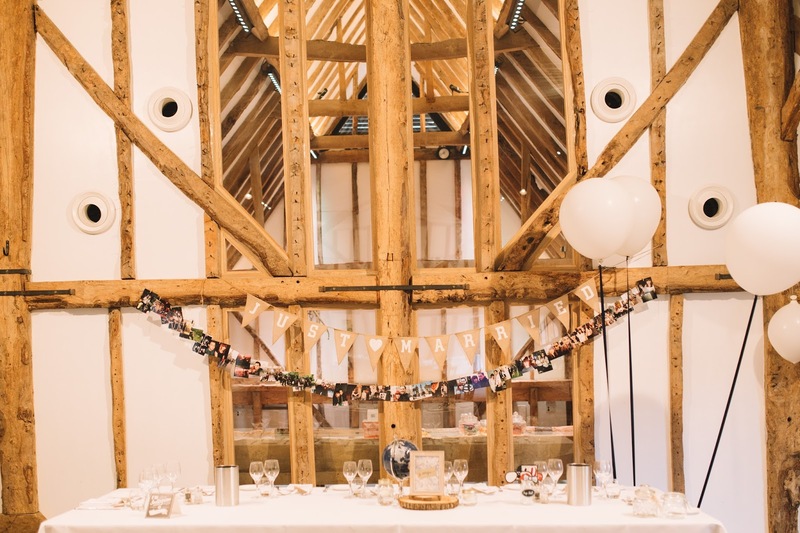 The table plan is something you may start planning in the final weeks – I did mine a couple of days before the wedding, which I’m so glad I did as we had a few drop outs. So my advice would be to design two days before your wedding. But make sure you have all your props a few weeks before! 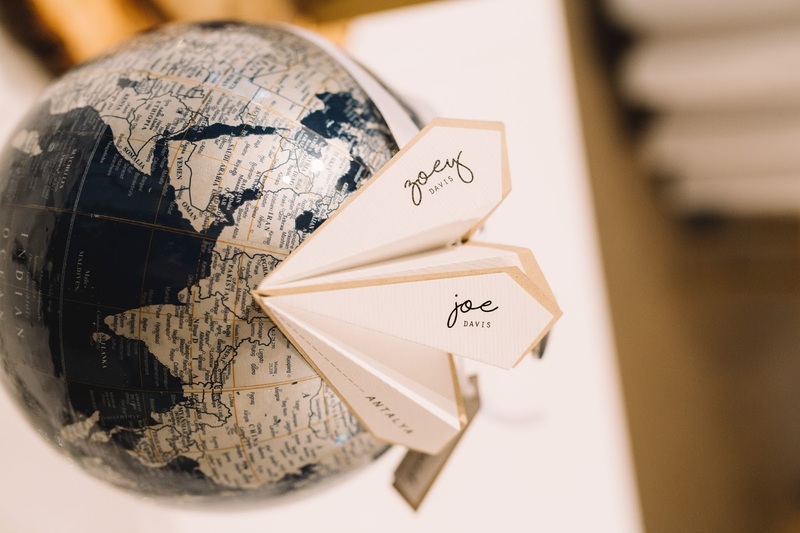 I immediately knew what I wanted to do for the table plan – a huge map with tags pinpointed to all the places Joe and I had travelled to together. 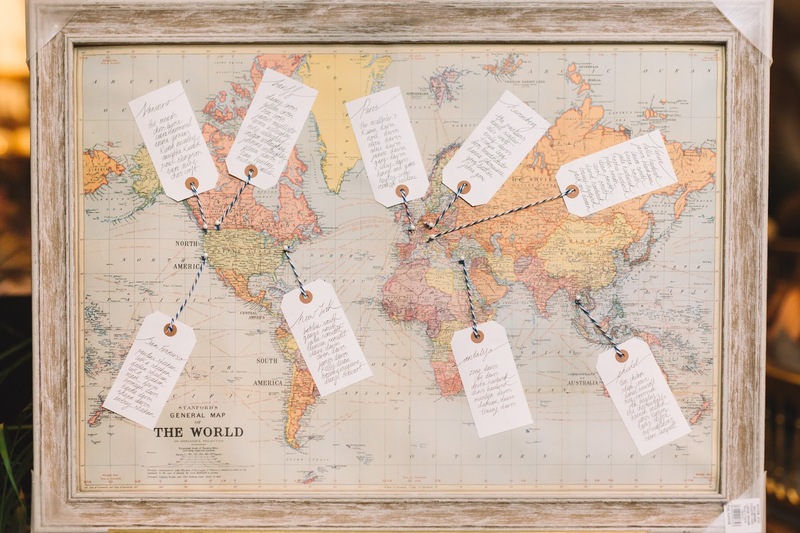 I stumbled across something similar on notonthehighstreet, and ordered the standard world map which was only £10.50. I then ordered some white tags, navy and white striped twine and white pins from Amazon. The frame was from B&M which cost around £5. For the typography, I hand wrote everything in my own ‘scripted/calligraphy style’. If you want to achieve that gorgeous scripted style, you can buy calligraphy books to help you practice, I’d recommend this one! Alongside the table plan we had to think about the name cards. 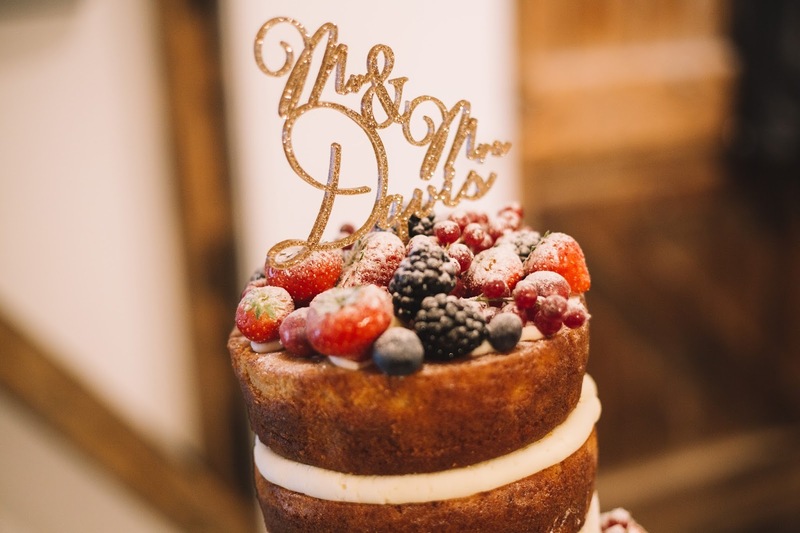 We’ve been to weddings and people have kept them quite traditional – a rectangle stand with your name printed on. But I wanted to do something a little different. I liked the idea of creating little paper areoplanes, and so I found some designs on Pinterest, sent them to one of my design friends and she created the above. They are honestly so beautiful and intricate. She did an incredible job on them, as well as having the patience of a saint to design and make over 90 of them! 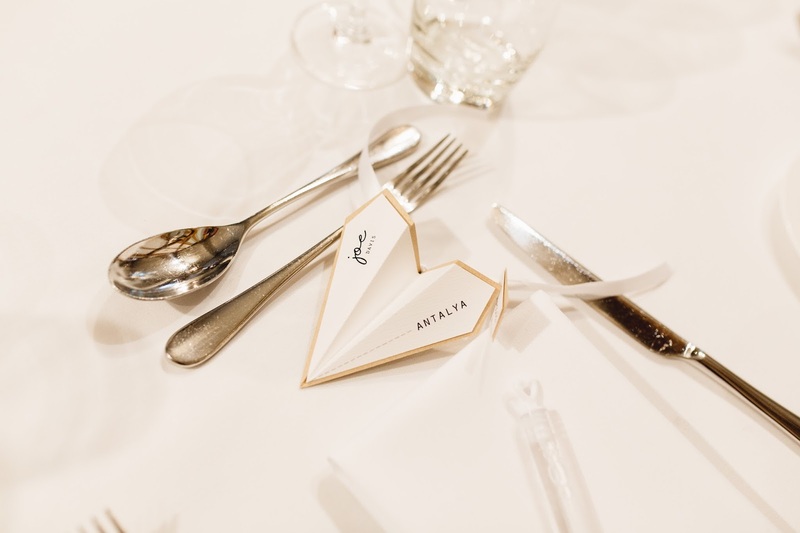 To create your paper areoplane name cards, all you need is a paper areoplane template – which you can add text your personalised text on Illustrator or Indesign. As well as cream card, brown card, glue and white ribbon. 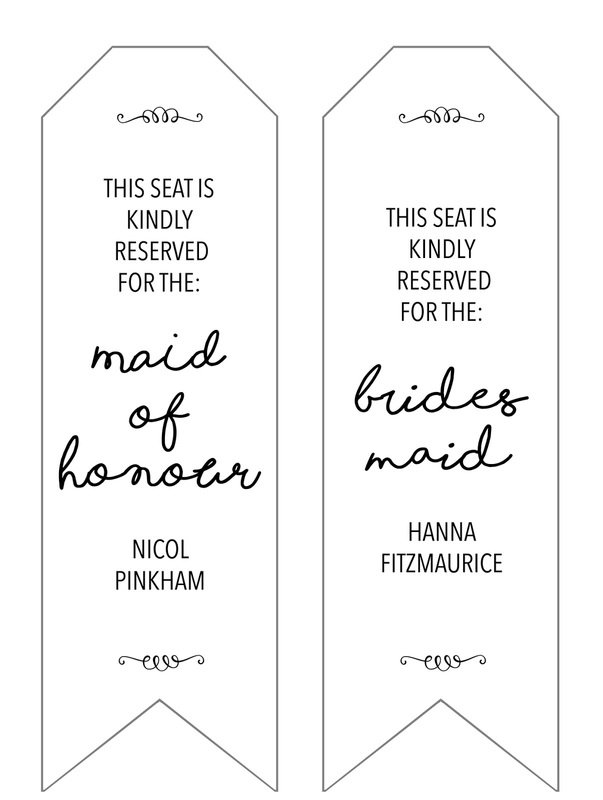 The table name designs were super easy to do! I printed off an A5 vintage looking map onto cream card, glued a brown tag onto the map and wrote my desired country name on them. I bought some A5 frames (which matched the table plan frame) which added the final touch. With regards to styling them on the tables, I thought the frames worked really well stacked on top of a few log slices which I bought on eBay! 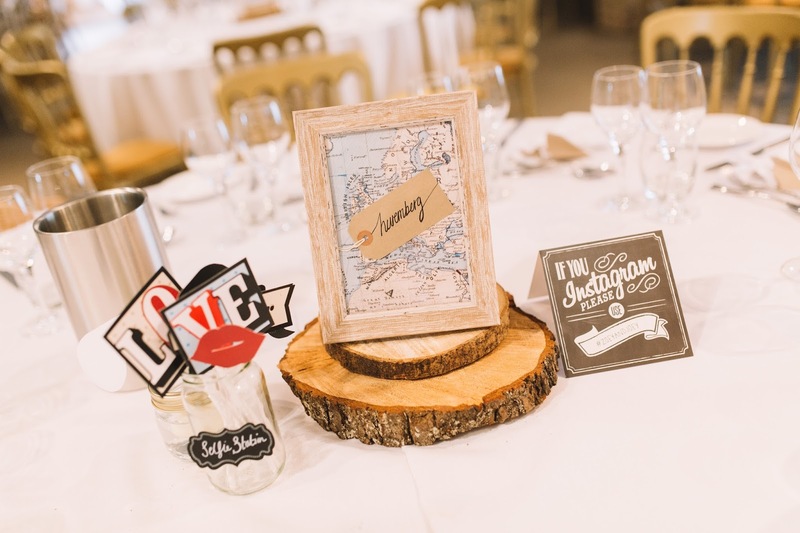 We wanted to keep our guests entertained so we decided to have a selfie station with photo booth props – this went down really well with both the adults and kids! I found this photo booth stick props template online, which you simply cut out and stick on lolly pop sticks or straws. To make sure the photo booth props are secure and in place, I’d advise using a glue gun which you can buy really cheap from any arts and craft stores! Joe, myself and my bridesmaids had such a fun evening making these. There were over 100 to cut out and stick together so I’m glad we had the extra pairs of hands. To style the photo booth props, I bought a set of jam jars from eBay and some chalk stickers from Amazon. We already had a chalk pen so all I had to do was write ‘Selfie Station’ on them. Name tags for the ceremony are optional. I only created a few for the first two rows which included the main wedding party. I found a tag template on the internet and added the text in Illustrator. After I was happy with the design, I printed them on brown paper, cut out by hand, hole punched a hole in every single one and added the final touch of twine. For mine and Joe’s chair’s, I bought these Mr & Mrs hessian chair covers from eBay. We wanted a few extra bits at the wedding, one being – wedding wands. 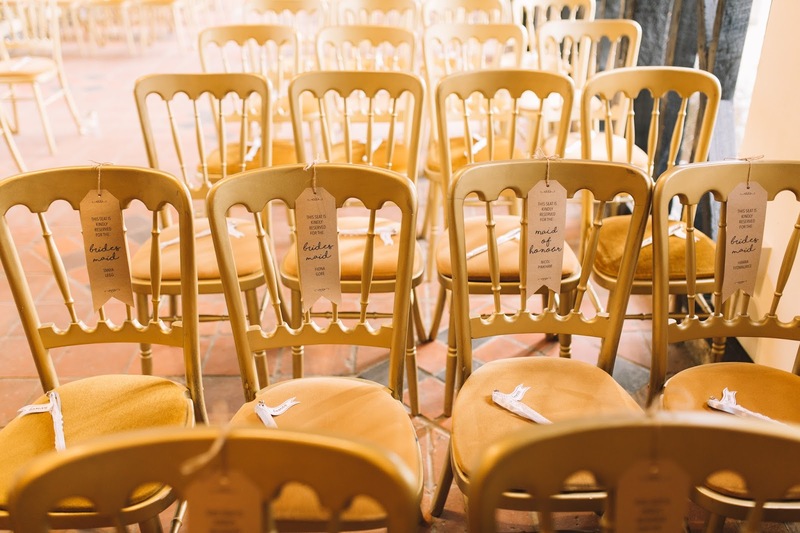 We wanted each chair to have one, so that when we walked down the aisle after we said our ‘I do’s’, everyone would wave their wands and it would create a lovely photo. I bought these from Ginger Ray. I picked ours up in the sale, I think they were about £3 for a pack of 10. So do keep your eye out for any Ginger Ray sales as I know some of their products can be quite expensive. Alternatively, you can make your own if you’re on a budget! 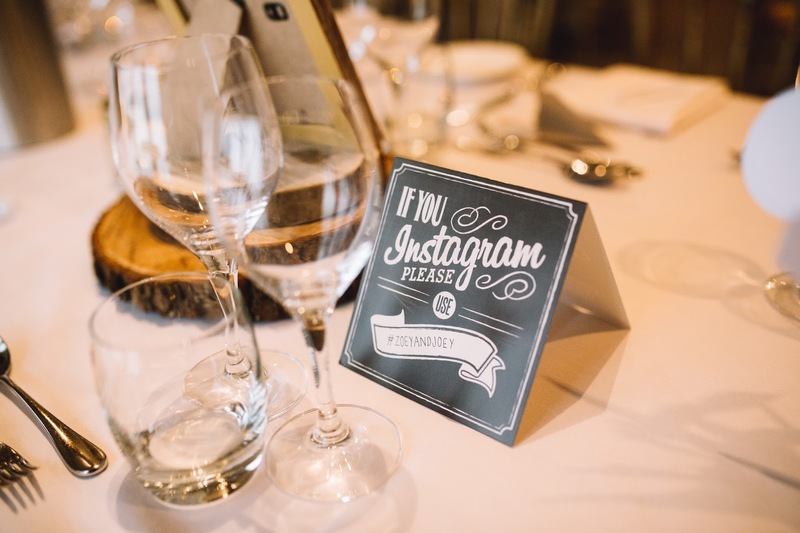 Another item we picked up from Ginger Ray were these cute little ‘If You Instagram’ cards where you write your own unique hashtag, such as #ZoeyandJoey. These retail at £5 for a pack of 5 which isn’t too shabby. Another nice little touch is to print lots of your favourite photographs of you and your loved ones and hang them up. 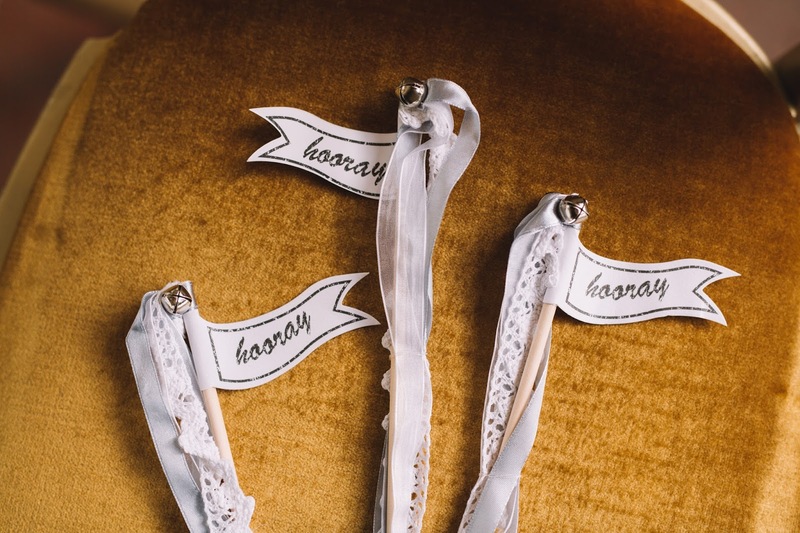 All you need is twine, your chosen photos, mini pegs and some pins! It works out really inexpensive and you’ll make use of the photographs afterwards too! We also bought a few extra personalised things too. 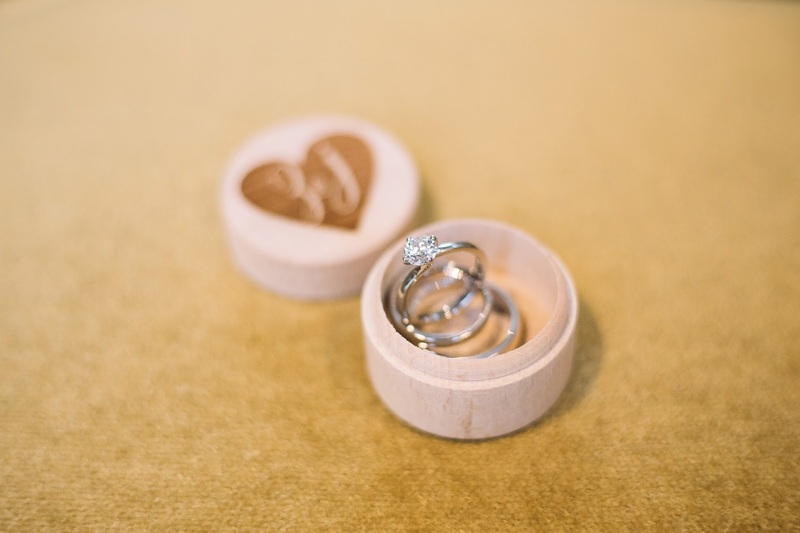 We bought our gorgeous gold glittery cake topper from notonthehighstreet, and our personalised ring box from etsy. 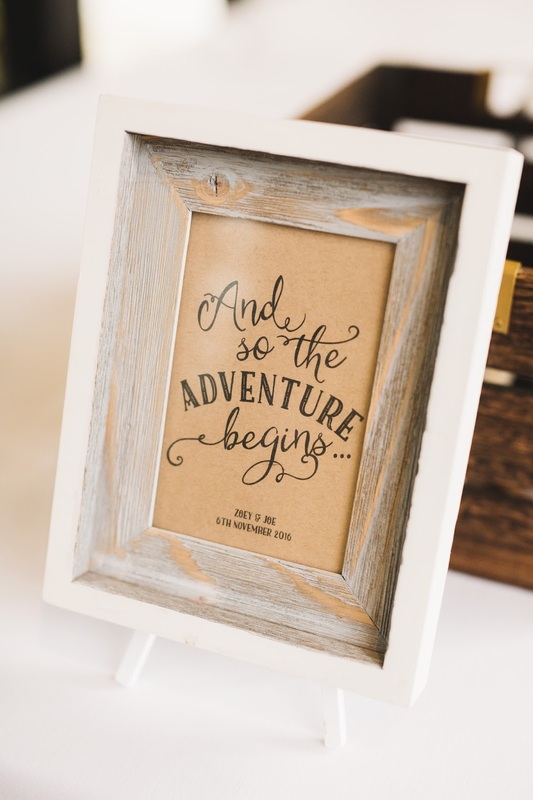 I found designing and making the wedding stationary the most stress-free and one of the best parts of wedding planning and I’m sure you’ll love it too. I hope this has been somewhat helpful. If you have any questions about any of the above, then please leave them in the comments below. 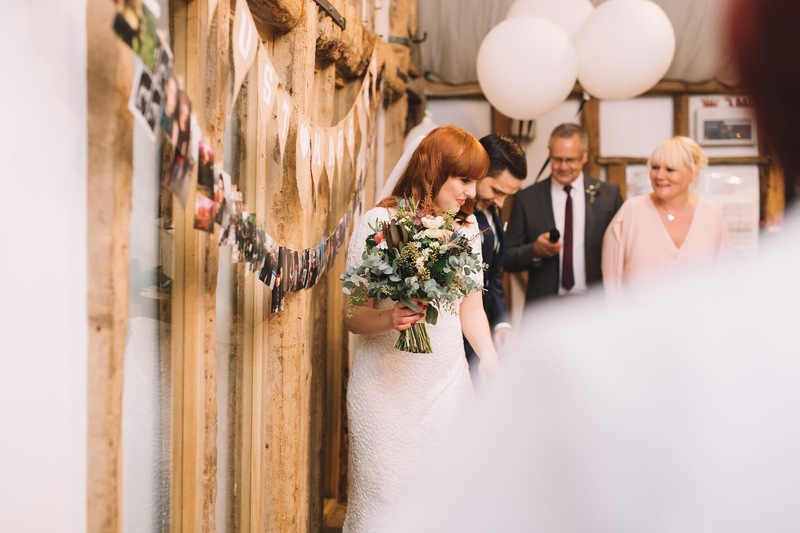 If you’re interested in reading more about my wedding experiences, I blogged about mine and Joe’s initial ideas here. As well as my initial hair and make-up ideas here. The stressful period with eight weeks to go, which you can read here. 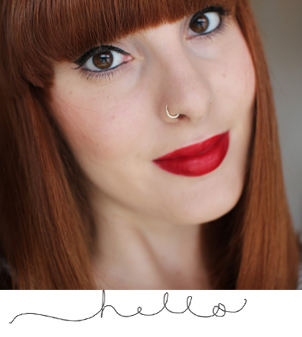 And last but not least I talked about choosing your wedding make-up here. As always you can reach me on social media. I have Instagram: @zoeyoliviablog, and twitter: @zoeyoliviablog. This is truly an astounding post, thank you for imparting this to us.